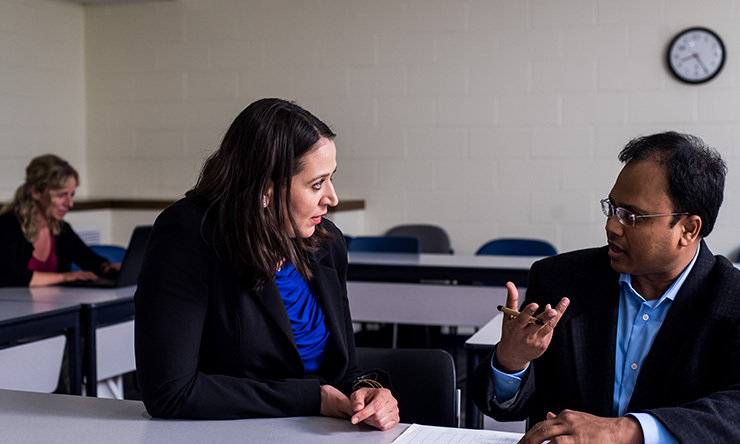 Geared to experienced managers and professionals who are interested in management, the program strengthens your job performance, the potential for advancement in your career or organization, and awards the credentials – your doctorate – to pursue consulting or teaching. Our graduates work at Carl Sandburg College, Deere & Company, Rockwell Collins, First Midwest Bank, University of Northern Iowa, and many others. Our students tell you why their DBA studies at SAU was just what they needed to succeed professionally. The DBA program will help you develop analytical skills, writing skills, and familiarity with a broad array of literature in the management field. Some graduates use these skills and insights to advance their careers in diverse fields such as banking, insurance, manufacturing, energy, and IT consulting. Others use their talents in education, and advance into administration or faculty positions. Still others have made career changes and become full-time educators at colleges and universities. 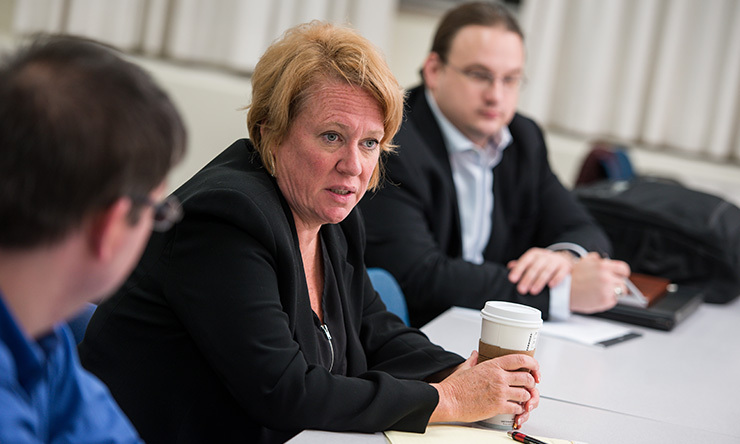 Coursework and class discussions emphasize ethical research and scholarship. 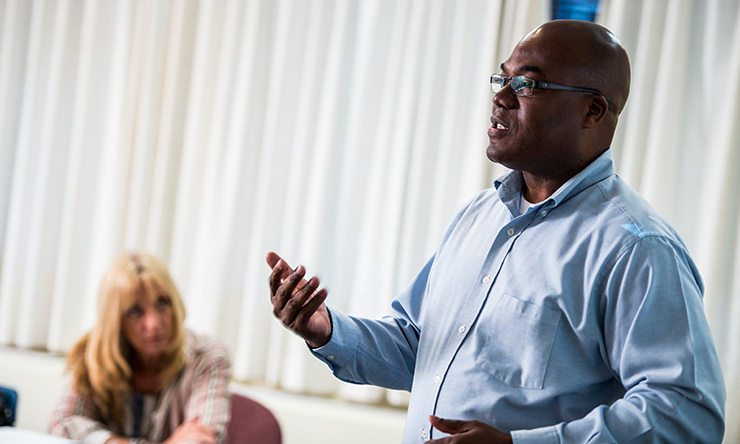 Our students come from diverse backgrounds and broaden perspectives in the classroom. They work in a variety of professions and are in various stages of their careers. International students - from countries as far away as Indonesia and China - provide further insight into management issues. Dissertations are more than just research projects. You'll use what you learn in class to benefit your company, through activities such as analyzing mentoring programs, employee performance, and quality initiatives. You'll experience a spirit of cooperation and generosity in our program and on campus, which reflects the quality of life in the Midwest and the Quad Cities. How is a DBA different from a PhD? Both the DBA and PhD are graduate degrees in business. The exact nature of these degrees differs by institution. Generally speaking, the PhD in business is designed to prepare individuals for careers in education with a strong emphasis on academic research. While our DBA program does include a high degree of academic rigor, we often include a more applied focus than would be found in some PhD programs. How long will it take to get my DBA? That depends on the pace you choose. One of our first students completed the entire program in four years while working full-time. However, if you take two classes per semester and one in the summer, you can complete your courses in about 2-1/2 years. This is followed by comprehensive exams and the design and completion of a dissertation. This is the culminating research project. You choose an area of interest. Then, working with a faculty committee, you develop a detailed research proposal. If the committee approves the proposal, you collect data, analyze it, and write a detailed report. You can read the descriptions of the more recent dissertations here. What can I do with a DBA degree? Honestly, that's what's great about the DBA; whether you want to teach at the college level or advance in the business world, the DBA can give you that versatility. The SAU DBA is designed to enhance your critical thinking and analytical skills, and provide a larger breadth of career options--from academia to consulting. Knowledge gained from your DBA experience can improve performance in your current organization or be a stepping stone to other career opportunities. Is the DBA available through online courses? While some courses may occasionally use some distance-learning tools, professors teach all classes on the main campus. 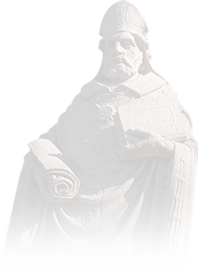 Is the St. Ambrose DBA program accredited? Yes. 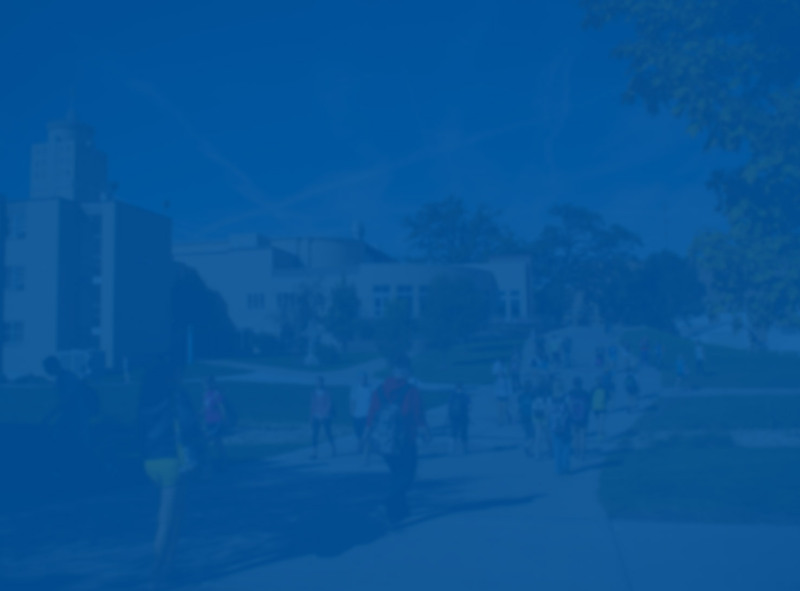 St. Ambrose University is accredited to offer the degree by the North Central Association of Colleges and Universities and by the Accreditation Council for Business Schools and Programs (ACBSP). As the culmination of your academic achievement, the dissertation presents an opportunity for you to research an area of interest. You'll work one-on-one with your dissertation chair to develop a topic that will evolve into a detailed research proposal. Once the proposal is approved, you collect and analyze data, write a report of the results, and discuss your research and findings in a dissertation defense. Classes such as research methods and statistics provide the training and tools necessary to complete your research project, the progress of which is monitored by the dissertation chair. Research reflects our students’ diverse interests. Topics cover a wide range of subjects, such as leadership, organizational change, and mentoring. There's a partial list of dissertations below (from the past 10 years). Aiello, A. (2018, April). The Relationship of National Culture and Turnover: An Examination of Differences Employees Give for Quitting in Three Countries. Aprianingsih, A. (2012, December). The Kaleidoscope Career Model and Work Family Conflict: An Exploration Across Career Stages. Behnke, T. (2010, April). Knowledge Sharing at Work: An Examination of Organizational Antecedents. Carlock, B. (2008, May). A Model of Public-Private Partnership Success: Case Studies of Partnerships Between U.S. Army Installations and Private Firms. Coe, M. (2013, April). Intention to Sit for the CPA Examination: An Investigation of Cost, Exam, Support and Career Factors. Davis, J. (2014, August). Social Networking Sites: An Exploration of Usage, Benefits, and Drawbacks. Denker, J. (2014, May). Looking for Performance in All the Right Places: What Do New Venture Startup Teams Have to Do With It? Dunne, B. J. (2013, November). The Employee Psyche at Work: A Model of How Psychological Contracts Moderate the Relationship Between Psychological Safety and Engagement. Duster, S. (2010, April). Factors that Motivate Protégés to Participate in Formal Mentoring: Do Motivated Protégés Report Higher Mentoring Effectiveness? Eaton, D. (2008, December). An Investigation of Generational Differences in Job Satisfaction in a Bureaucratic Environment. Edenborg, M. (2013, April). The Effect of Type of Education on an Individual's Self Employment Choice: Comparison of Vocational and College Education. Geil, M. (2016, December). Beyond Cultural Intelligence: The Influence of Polychronicity and Core Confidence on Perceived Global Effectiveness. George, S. (2014, September). Perceptions of top management team commitment to corporate social responsibility: An exploration of the relationship with employee engagement. Gilstrap, R. (2015, August). Developing an Inimitable Resource: The Relationship between Core Confidence and Employee Engagement. Graham, J. (2012, May). Same Goal, Different Day: The Moderating Effect of Experience on the Goal Difficulty - Performance Relationship in a Repetitive Goal Setting Environment. Guillaume, P. (2015, May). Permanent and Seasonal Employees: An Investigation of Differences in Perceived Organizational Support, Job Engagement and Dedication to Service Quality. Hager, M. (2014, May). An examination of Social Skills as a Correlate and Moderator of the Relationship Between Networking Behaviors and Career Outcomes. Harb, S. (2011, May). Employee Engagement: The Impact of Intervention Methods. Hechtel, K. (2010, April). An Examination of the Social Capital Requirements for the Selection, Training, Performance, and Retention of Industrial Sales Personnel. Herlein, M. (2009, December). An Examination of Managerial Competencies and Their Relationship to Performance. Hibbeler, P. (2008, April). Communities that Accept or Resist Supercenters: A Comparison of Cultural Differences. Huegel, B. (2015, December). Employer Support in Public Accounting: An Investigation of the Effect on Organizational Attraction. Hughes, D. (2016, October). Doctoral degree awarded posthumously. Jayne, R. (2008, May). Experienced Business Angels: What They Know, Who They Know, and How They Contribute to a Startup Firm's Performance. Juergens, S. (2012, August). Experiential Learning: How the Utility of Experiential Learning Within a MBA Course Enables Transfer of Learning. Kleine, R. (2013, December). Formal Mentoring Relationships: An Examination of Processes, Mentor Rank, and Protégé Satisfaction. Linderman-Hill, K. (2018, November). Engaging Top Performers: The Influence of Core Confidence on the Relationship Between Job Characteristics and Engagement. Mahon, M. (2017, September). The Influence of Leader Prototype Congruence on Leadership Beliefs. Mayes-Denker, K. (2014, May). Private or Public: Does Corporate Social Responsibility Influence Profit? McCallum, S. (2008, May). An Examination of Internal and External Networking Behaviors and Their Relationship to Career Success and Work Attitudes. Miller, L. (2015, November). Firm Growth: An Explanation of the Processes of Growth of New and Small Firms. Murphy, C. (2008, May). Antecedents of Job Search Success for NAFTA-Eligible Dislocated Workers. Rothbardt, J. (2012, April). Applicant Attraction to Socially Responsible Corporations: The Moderating Effect of Core Self-Evaluation. Schmidt, H. (2010, April). An Examination of Service Learning and the Development of Work-Related Skills in Undergraduate Business Students. Siebert, D. (2008, April). An Investigation of Intergenerational Workplace Conflicts and Managerial Responses. Simmons, J. (2012, December). The Kaleidoscope Career Model: An Investigation of Authenticity, Balance, and Challenge and Their Relationship with Networking Behavior. Styvaert, M. (2011, May). Core Self-Evaluations: A Malleable Disposition? Thome, M. (2014, October). Turning Outsiders to Insiders: A Study of Job and Community Embeddedness on Voluntary Turnover. Van Den Beldt (2015, April). Immigrant Entrepreneurship: A Qualitative Study of Factors that Facilitate the Startup of Restaurants. Vaske, A. (2008, November). The Relationship Between Motivation to Volunteer and Cultural Preference A Study of a Youth Development Organization. Wade, M. (2008, December). Getting Off The Ground: Factors Related to Protégés' Initiation of Mentoring Relationships With Their Formal Mentors. Wolbers, G. (2016, June). Toward a Generative Capacity Framework of Firm Growth. Zama, A. (2012, May). Corporate Elites - How They Came to Be: An Analysis of TMT Composition Change Following CEO Succession. Financing a doctoral degree might seem daunting, but our students quickly learn that a St. Ambrose education can be affordable (and worth every penny). The 2019-20 tuition rate is $1,106/credit hour. The program is usually completed in a total of 48 credit hours. Prospective students are encouraged to contact the Financial Aid Office to learn more about the loans and other options that can help fund your education. In some cases, employers offer tuition reimbursement for completed coursework. Does your employer offer tuition reimbursement? This is a common method many of our students use to pay for their graduate education. Because it varies when companies reimburse their employees, St. Ambrose offers deferred payment until you get reimbursed or until you complete your classes (proof of completion). Both options are helpful when you want to avoid the use of personal finances to pay for classes. To qualify for employer deferral, our enrollment specialists will be happy to walk you through the process. If you aren't sure your employer offers tuition assistance, we recommend speaking with your human resources representative. Do you have military benefits you would like to explore? We have an admissions specialist who is an expert in military benefits who will work with you to determine available dollars and how to invest this benefit in a St. Ambrose education. If neither of these options pertain to you, there are federal loans available. Graduate students have up to $$20,500 available per academic year for low-interest loans not based on income level. Our Financial Aid Department can help you with any questions. Research methods: Provides tools so you can design research studies and analyze data. Seminars in four major areas: Covers organizational behavior, human resources, strategic management, and organization theory. Case research course: Helps you analyze organization cases and develop abilities to research and write case studies. Topics courses: An in-depth study of a particular area in the fields of organizational behavior, human resources, strategic management, and organizational theory. Students complete all courses in Research Methods and Readings Seminars. All coursework must be completed before taking written and oral exams. Both written and oral exams are required. The comprehensive tests examine your command of the management literature and your ability to integrate this literature into models that have theoretical significance and practical utility. Comprehensive exams occur in March and October. You will take the written examination over two days, which consists of a 4-hour testing period each day. Upon successful completion of the written examination, you then complete the oral portion. The time limit varies depending on the questions faculty ask and your performance. The dissertation is your final step before graduation. Upon successful completion of comprehensive exams, you begin the dissertation class, DBA 990 Dissertation. You'll need to get a few things together to submit along with your application.